Here is the new outdoor panel Alba: a bright suitable name for expressing all together an entrepreneurial achievement, new industrial sights inspired by an authentic soul Made in Italy. 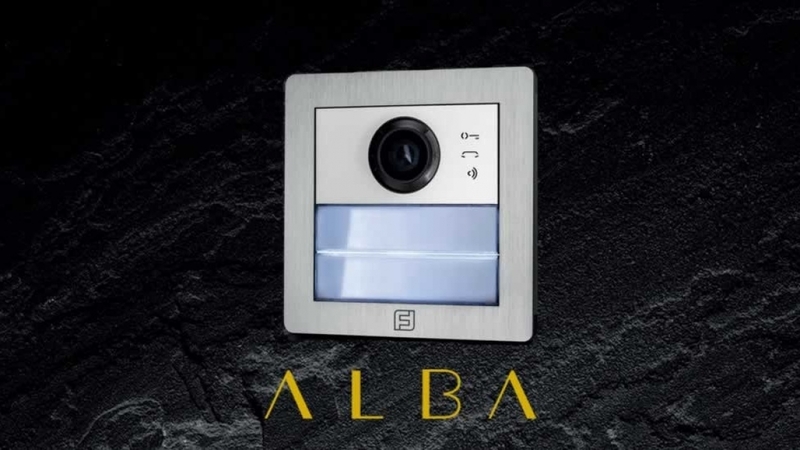 Conceived, developed and produced completely in Italy, Alba brights for its high-caliber design planned for the most advanced technological Farfisa systems, starting from Duo System where the panel is self-powered. Modularity and flexibility enhanced by a body made up of anodized aluminium with brushed finish and structural system “weatherproof”. The applied wise use of materials and the aesthetic purity led the concept obtaining concealable structural elements – hidden speaker in the mechanism of the camera, microphone inserted in the lower part, not visible. A strong refined presence that preserves an advanced technological heart, compatible with all Farfisa outdoor panels and Videointercoms. Alba distinguish itself by its sensibility and attention for people with disabilities: the wide-angle lens allows to focus on people on a wheelchair; the product can be equipped with specific coil for facilitating the compatibility with acoustic devices for hearing-impaired users, the print on the call key is embossed in Braille, for making it recognizable by blind users and the flashing signal for forwarded calls helps people with hearing difficulties. Alba introduces for the first time the new corporate logo, designed for the 50th anniversary.